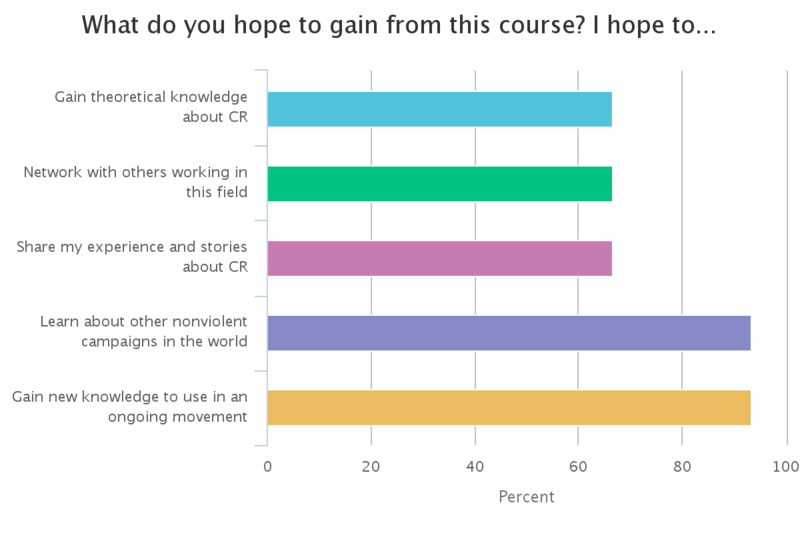 ICNC offered a moderated online course on civil resistance in partnership with the International Institute for Peace at Rutgers University Graduate School, which took place from October 6 to November 17, 2016. A record 189 applications were received in response to the call for the 2016 online course. The quality of applications was very high, and three rounds of application review were necessary to determine the final selection of 55 participants. Among them were 32 women and 23 men from 35 countries, residing in 26 countries. Most of them were mid-level professionals; a number of them were experienced civic organizers and activists. A handful had journalism experience, and a few were NGO executives. Many of them engaged in academic work, usually in conjunction with other activities such as civic organizing and activism. During the orientation webinar, participants were asked what they hoped to gain from the online seminar and what sorts of activities they had been ngaged in the past few years. 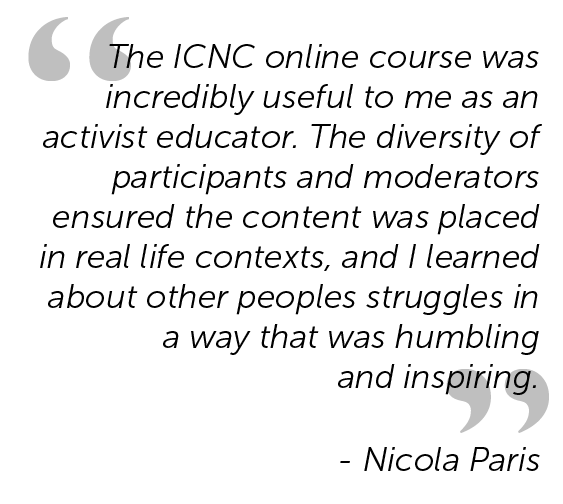 The graphs below provide an overview of the diverse group of participants who took the ICNC online course in 2016. They indicate that participants were strongly interested in learning about nonviolent campaigns around the world and gaining knowledge on civil resistance that they could use in the field. Seven ICNC academic advisors joined ICNC staff to moderate various discussion forums in the online course, adding significant value to the overall educational experience. The course moderators included: Dr. Erica Chenoweth, Dr. Kurt Schock, Dr. Jason MacLeod, Dr. Mary King, Dr. Stephen Zunes, Dr. Tom Hastings, Dr. Veronique Dudouet, Dr. Maciej Bartkowski, and Amber French. Check out what participants thought about course moderation. In addition to interventions in the forums, course moderators provided weekly summaries of forum discussions in each module, highlighting key points made, debates that took place, and core information shared. The online course consisted of an introduction module and six thematic modules. Each thematic module was released at the beginning of the week and the participants and moderators engaged in different forums of the module throughout the week. A detailed course outline is provided below. 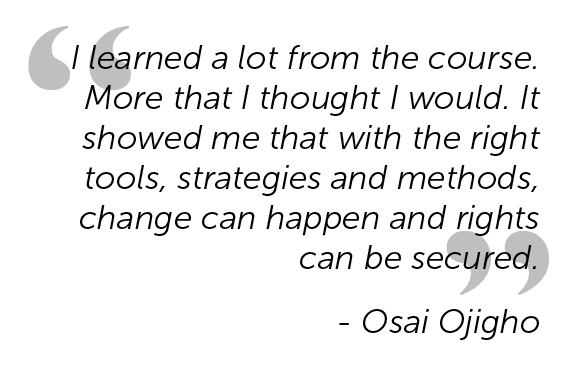 Check out what participants thought about the course content. In the welcome module, we laid out the objectives of the course. We discussed course activities, including forum posts, recorded webinars, readings, videos, webinar meetings and online discussions. We then introduced the participants and course organizers and moderators. We provided online learning tips to help participants make the most of the online learning experience. Finally, we introduced participants to the People Power Game: A Strategic Game About Civil Resistance, a strategic video simulation that participants play throughout the course, during which the player takes on the role of a strategic planner for a nonviolent movement. In this session we laid the theoretical groundwork out of which this field has grown, digging into both data and the big picture. Virtually every day, somewhere in the world, there are people engaging in civil resistance. But what do we mean by this term? Do we all understand it the same way? How is civil resistance defined and spoken about in participants’ towns, communities, regions or countries? In this session we clarified the concept of civil resistance, looking into power that underlies people’s actions and considering the track record of civil resistance over the past 110 years, including the reasons behind its effectiveness. This module aimed to equip participants with data to share with others in their networks about the effectiveness of civil resistance, and to enable them to articulate what civil resistance is in a clear and concise manner. In this session, we looked at the emergence of civil resistance, the role and impact of conditions, and the importance of skills. We discussed the commonly-held view that certain conditions need to be in place for civil resistance to succeed. We looked at how skills of a movement actually stack up against the conditions civil resistance faces in a particular struggle context and what makes nonviolent actions effective in an environment that inhibits civil resistance. This session explored how civil resistance emerges often despite unfavorable conditions, considered various social developments within groups that make them more likely to rise up, and reflected on the importance of conditions in analyzing emergence and trajectories of civil resistance struggles. This module aimed to help participants understand the interplay between skills and conditions, and how skills can help overcome adversarial conditions. In this session, participants looked at what strategy in civil resistance is, and how it relates to tactics. We examined examples of different tactics, including cultural resistance tactics, and discuss tactical innovation, including strategic sequencing of tactics that enhance the effectiveness of nonviolent methods and campaigns. Finally, we explored different conflict analysis tools that help movements systematically assess and analyze the battlefield in which they are engaging nonviolently. This module featured a webinar conversation with Jonathan Pinckney about his ICNC Monograph findings on nonviolent discipline. In this session, we started with a discussion about repressive contexts in which nonviolent resistance movements take place, and the phenomenon of backfire when violence against unarmed activists boomerangs back to those who carried out the repression. We explored how civil resistance movements can optimize the impact of backfire and use it to their advantage. How does the side that uses repression aim to hinder potential backfire? We then discussed defections that often, though not always, occur as a result of the backfire effect. This module focused on understanding defections from one group — security forces — and explores conditions under which the defections might happen. It also explored how regimes often try to mitigate the likelihood of security defections, and strategies that movements might deploy to increase chances of loyalty shifts among security forces. The last topic that this module explored was that of violent flanks. We looked at how the presence of a violent group — either part of a larger nonviolent movement or existing separately from it (e.g. armed insurgency) — impacts the dynamics and effectiveness of nonviolent struggle overall. This module explored a variety of topics in the study of civil resistance, including: people power to fight corruption and impunity, civil resistance in war-torn environments, women and nonviolent resistance, democratization and civil resistance, and civil resistance and corporate governance. These (and other) topics were considered new frontiers in the quickly evolving field of civil resistance studies. They are often seen as either under-researched or only now gaining significance in the analysis of nonviolent conflict. First, we took an in-depth look at how anti-corruption campaigns work. Then we explored how people organize nonviolently in extremely violent environments, and discussed the role of women and gender in nonviolent movements. We also examined the long-term impact of civil resistance on democratization and democratic transitions and, finally, looked at how civil resistance can challenge effectively unlawful or unjust corporate behavior. In the last two days of this online course we solicited participants’ views about the course and their learning experience. We asked about their learning progress, overall educational experience, assessment of the course content, interactions in the forums, and their personal engagement during the six-week period. 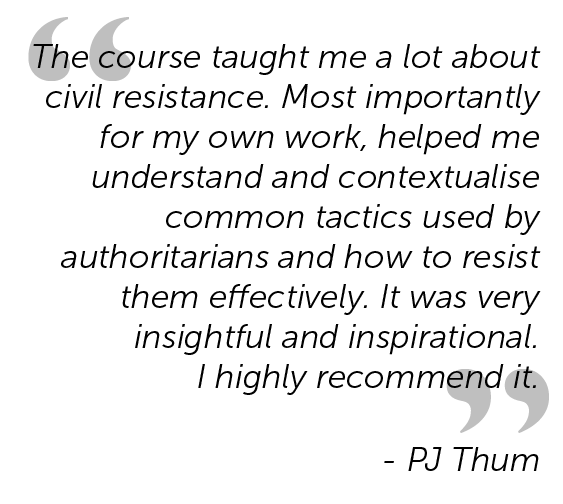 This feedback has allowed us to improve our future online courses and make our teaching pedagogy on civil resistance more effective and more impactful on all learners involved. ICNC distributed pre-seminar and post-seminar surveys to measure gains in learning progress among course participants. 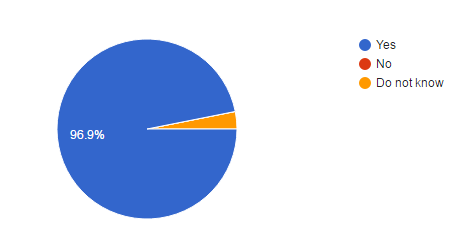 Included below are the graphed responses to selected questions from the surveys. In general, they illustrate a positive trend. On the scale below, select the number that best represents your current knowledge of civil resistance or nonviolent movements. On the scale below, identify your comfort level in speaking to others about civil resistance or nonviolent movements. On the scale below, select the number that best represents your view about how important you think nonviolent discipline is in a successful civil resistance movement. 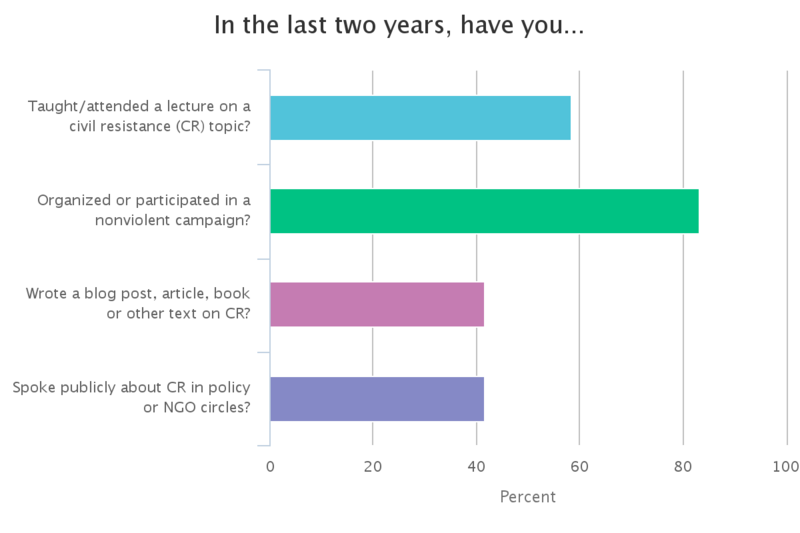 96.9% of participants who completed the post-seminar learning gains survey thought that civil resistance was more effective than violent resistance against violent regimes in comparison to only 75% of participants who completed the pre-seminar learning gains survey. Do you think that nonviolent civil resistance is more effective than violent resistance against repressive regimes? 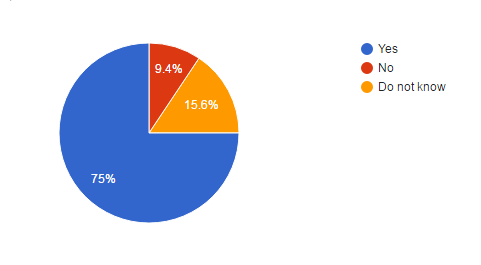 Included below are graphed responses to selected questions from the final course evaluation. Overall, more than 91% of participants who completed the final course evaluation felt that the course met or exceeded their expectations. Over 97% of participants would recommend the course to others. 99% of participants felt that the course was relevant to their current or future work. More than 97% thought that the course was well organized and planned. 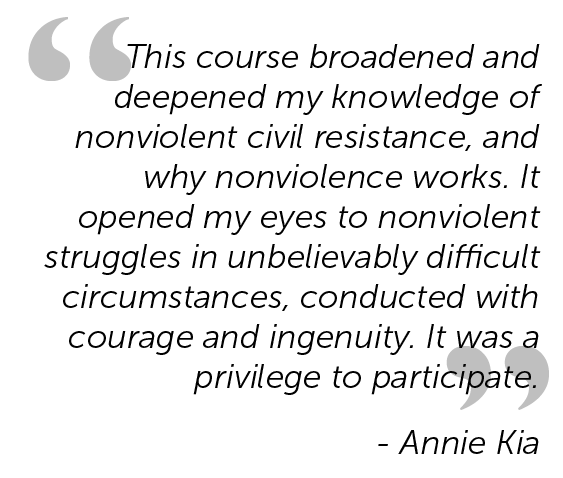 100% reported that they had much more knowledge of nonviolent movements and civil resistance than they did before the course.